The project area lies at the northern end of traditional Kumeyaay (or “Tipai”) territory in eastern <?xml:namespace prefix = st1 ns = "urn:schemas-microsoft-com:office:smarttags" />San Diego County. Ethnographic data for the Kumeyaay and, in particular, the Kwaaymii Band, indicate that Indian people would have used Mine Wash and surrounding interior valleys for food procurement, ceremonies, and winter/spring settlement. The archaeological pattern in Mine Wash and environs shows a single relatively large occupation location with abundant cultural remains, a few smaller-sized encampments, and numerous isolated grinding/milling areas and roasting pits. Excavations conducted at the largest occupation site on Mine Wash yielded considerable evidence of plant-food processing, stone-tool manufacture and use, ceremonial activities, and participation in a wide-ranging trade network in Late Prehistoric times. Prehistoric settlement in and around Mine Wash is consistent with social and subsistence-related patterns identified in ethnographic accounts for this region. 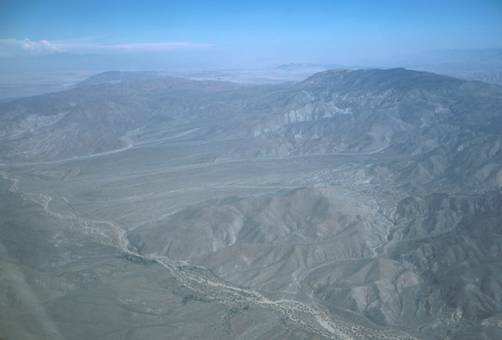 The geologic setting of Anza-Borrego Desert SP is dominated by two geomorphic provinces, the Peninsular Ranges and the Colorado Desert. The Peninsular Range is an expansive complex of batholithic rock that extends from Baja California northward to the Transverse Ranges. The eastern escarpment of this mountain range consists of a series of well-exposed fault blocks (California Department of Parks and Recreation 2003:2-12-2-13). The Colorado Desert, as a vast region, is bounded by the Colorado River, the Peninsular Ranges, the Sea of Cortez, and the Transverse Ranges. Three major fault zones, mountain ranges, and the Salton Trough represent conspicuous geologic structures within the Colorado Desert. The park lies at the western edge of the Salton Trough. This region is one of the most seismically active in North America (Remeika and Lindsay 1992:37-51). It holds evidence for 500 million years of continent building, both uplifting the Peninsular Range and down-dropping the Salton Trough. The landforms of Anza-Borrego Desert SP largely represent the result of alternating cycles of tectonic mountain-building episodes and cycles of erosion and deposition (Remeika and Lindsay 1992:56-73). Anza-Borrego Desert SP, as might be expected in an area so vast, holds a highly diverse range of landforms, plant communities, animal habitats, and geologic formations and structures. The landforms can be broadly identified as washes, arroyos, and adjacent terraces, wetland and riparian areas (including, palm oases), open desert, transition, and montane. There are a total of 932 plant taxa belonging to 387 genera in 98 different families documented within the park. The plant family Asteraceae (sunflower) is most abundant with 135 taxa identified. The order Rodentia is the largest mammalian order in the park (31 species). Other mammals found within the park include, hares, rabbits, fox, coyote, mountain lion, bighorn sheep, and many others. Birds, reptiles, amphibians, and invertebrates are some of the other types of animals found within Anza-Borrego Desert SP (California Department of Parks and Recreation 2003:2-35-2-61). The park is unique for its desert riparian zones, such as, Coyote Canyon, Carrizo Creek, San Felipe Creek, and the 30 palm oases, each with perennial water. These water sources and less significant ones, such as, springs and tinajas, would have helped sustain humans through the millennia. The San Dieguito or Paleoindian Period, dating to the Early Holocene, is recognized by most researchers as the earliest cultural period in the Colorado Desert (Schaefer 1994:62-64). San Dieguito is a cultural concept first conceived by Malcolm Rogers. The sites have been characterized as primarily being “…found on mesa and ridges, generally lack midden and are often heavily eroded” (Warren and True 1961:262). 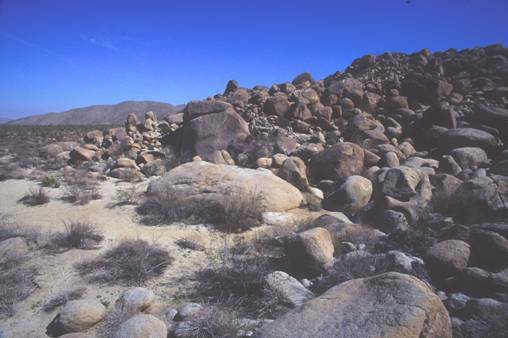 Warren (1984:92) hypothesized that the San Dieguito Complex of the Colorado Desert is comparable to Early Holocene cultural phenomena in the Mojave Desert. Wallace (1978:27) argued that a close relationship existed between San Dieguito and Lake Mojave artifact assemblages. The next cultural period in the <?xml:namespace prefix = st1 ns = "urn:schemas-microsoft-com:office:smarttags" />Colorado Desert, termed the Early Archaic, is defined by few sites and sparse remains (Schaefer 1994:64). 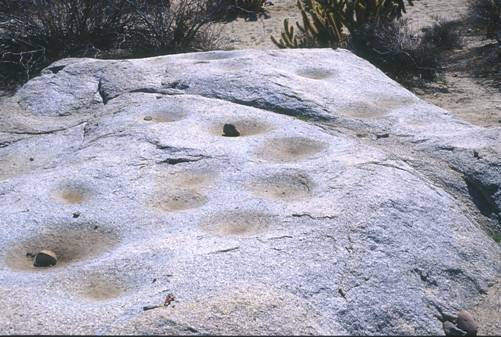 Cleared circles on mesa tops with desert pavement are characteristic of this time period, as well as, simple flake tools, no ceramics, and a lack of groundstone tools (McDonald 1992:13-14; Schaefer 1994:64). The Early Archaic, as defined by Jerry Schaefer and others, falls within the Middle Holocene (the Pinto Period in the Mojave Desert), a time characterized by long periods of predominately dry conditions and a “time of considerable and rapid climatic fluctuations” (Mehringer 1986:42, 49; Wigand and Rhode 2002:355). The Late Archaic, ranging in age from circa 4,000 to 1,500 years BP, is defined by people with a more diversified economic base. Paleoenvironmental data indicate predominately milder and wetter conditions in the Mojave Desert and surrounding regions during this same time (Wigand and Rhode 2002:355). The Late Archaic people were highly mobile hunters and gatherers with a low population density (Schaefer 1994:64-65). Indian Hill Rockshelter in the southern end of Anza-Borrego Desert SP yielded one of the few Late Archaic cultural components in the Colorado Desert (McDonald 1992; Schaefer 1994:65; Wilke et al. 1986). The archaeological visibility of Archaic sites in the park may be affected by geologic forces, such as, sheet wash and alluvial deposition, or, they are hidden by the dense cultural remains of later people. 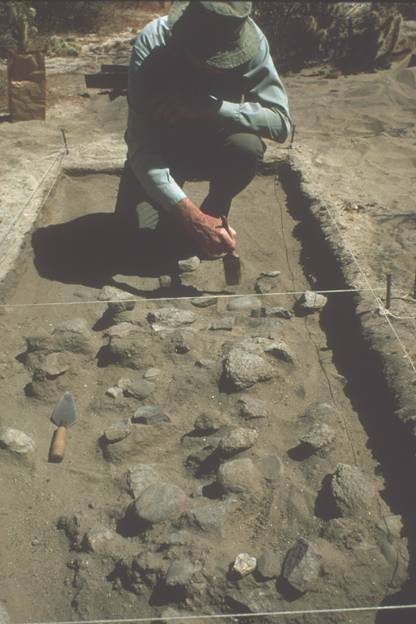 California State Parks, under the leadership of Fritz Riddell, began sponsoring archaeological investigations within Anza-Borrego Desert SP in earnest in the 1950s. William and Edith Wallace directed research in the southern half of the park during the late 1950s and early 1960s, while crews from UCLA under Clem Meighan worked in the northern half (Wallace 1962, 1995:6-8). The work of the Wallaces, for example, consisted of surveys in four major areas in the south end of the park: Bow Willow, Indian Hill, Mountain Palm Springs, and Indian Canyon, as well as, some limited test excavations (Wallace 1962; Wallace and Taylor 1958, 1960a, 1960b; Wallace et al. 1962). The sites encountered ranged from larger-sized occupation locations to small camps to small food-processing locations. The observations from surface surveys and the tests gave evidence of Late Prehistoric use by family groups that included yields of ceramics, manos, hammers, flake tools, core tools, some projectile points, roasting pits, bone fragments, and other cultural remains. The processing of Agave deserti was identified as an important cultural function in the latter park locations. Anza-Borrego Desert SP lay within the traditional territories of two Native American groups, the Kumeyaay and the Cahuilla. Significant portions of the central portion of the park and all of the southern section of the park had been occupied by the Kumeyaay (Cline 1984:12-19; Luomala 1978:592-593). 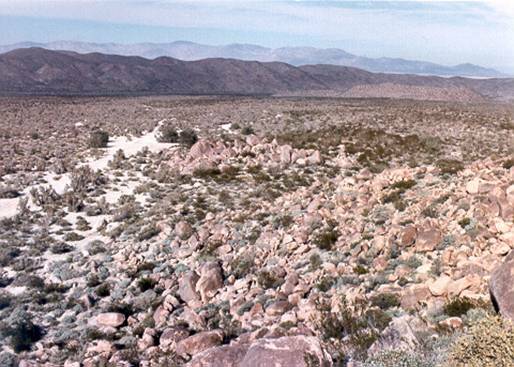 The Cahuilla used the northern section of the park, i.e., north of Borrego Springs (Bean 1978:575-576). Traditional Cupeno territory is peripheral to the northwestern areas of the park, such as, the middle fork of Borrego Palm Canyon (Bean and Smith 1978:588). The present project area along Mine Wash and upon Mescal Bajada, both of which lay south of San Felipe Wash, can be placed within traditional Kumeyaay territory. The Kumeyaay in prehistoric times were semisedentary residents of certain favored locations or base camps. Kumeyaay could then travel to outlying areas seasonally to harvest food resources and to avoid inclement weather, e.g., winter snows. Camps were selected for their favorable environmental circumstances, including, access to water, access to plant foods and hunting areas, access to outcrops suitable for food-processing activities, a natural microclimate or protection from strong winds, and other factors (Lucas 1995; Luomala 1978:597-599). Kumeyaay bands living in the Laguna Mountains migrated to the desert areas in and next to Anza-Borrego Desert SP during the winter and stayed until spring. Trails used by the prehistoric people followed canyons on the mountainside (Cline 1984:12-19; Lucas 1995:67). People of the Kwaaymii band wintered in Mason Valley, Hapaha Flat, Harper Flat, and other areas within and adjoining the park, and may have used the subject area, Mine Canyon, also (Cline 1984:12-19; Lucas 1995:6-7). 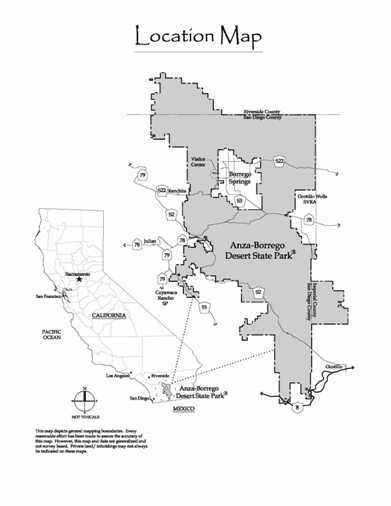 The present project area is situated within the central portion of Anza-Borrego Desert SP. Mine Canyon and Wash and adjoining drainages flow out of the Pinyon Mountains onto a broad, gently sloping bajada (“Mescal Bajada”). Mine Wash and adjoining drainages terminate at San Felipe Wash, a major drainage running out of the desert foothills toward the Salton Basin (Figure 2). The location of Mine Canyon and associated drainages provides excellent access to vast plant stores on Mescal Bajada, proximity to higher-elevation plants (e.g., pinyon pine and juniper) on Pinyon Mountain, and well-formed rock formations at the base of the hills for use in aboriginal food-processing activities. Occupants of this location potentially could easily access San Felipe Wash and its natural travel corridor to the Salton Basin (east) or to the desert foothills and mountains (west). Site CA-SDI-813, measuring ca. 8.4 acres or about 33, 813 square meters, is nicely situated on a gently sloping north aspect at the base of a boulder-strewn hillside. The site lies at an elevation 1,600 feet (487.7 m). Mine <?xml:namespace prefix = st1 ns = "urn:schemas-microsoft-com:office:smarttags" />Wash adjoins the site on its west side (Figure 3 below). 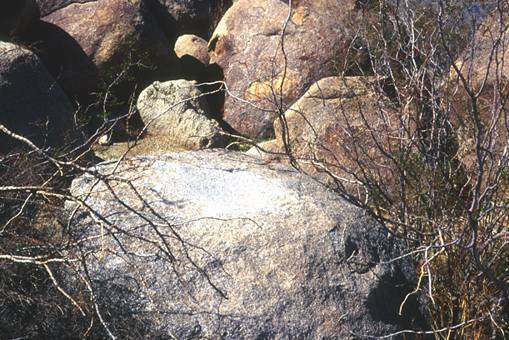 A low hillock of weathered granitic boulders divides the site area in half. Common plants observed around site CA-SDI-813 include the following: Ocotillo, creosote bush, cholla (multiple species), agave, prickly pear, beavertail cactus, Indian rice grass, Indian tea, jojoba, indigo bush, galleta grass, mojave yucca, fishhook cactus, desert ironwood trees, smoke trees, desert lavender, burroweed, chuparosa, and others. Figure 3: Mine Wash adjoins the site on its west side. The excavations at CA-SDI-813 yielded 5642 flakes, 5245 bone fragments, 438 potsherds, 96 manos (many with evidence of multiple uses and being fire-affected), 18 shell beads, 8 projectile points or point fragments, and other artifactual and subsistence remains. The geologic source for 45 out of the 46 obsidian samples was Obsidian Butte in the Salton Basin. The hydration values of the 45 Obsidian Butte specimens measured from 2.0 microns up to 9.7 microns, while almost half fall within the 3.0 to 3.9 microns range. Identified bone included specimens from jackrabbit, bighorn, pronghorn, deer, and others; the fish bone were from the minnow and sucker families, both which could have come from the Colorado River or Lake Cahuilla. The site holds 245 cupule petroglyphs, 143 bedrock metates (of varying forms), 52 bedrock mortars, and two yoni-style petroglyphs on 49 separate outcrops or boulders. 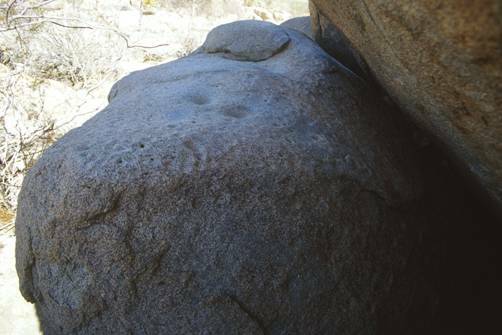 One boulder had 213 cupule petroglyphs alone (Figure 4 above). The hand tools for performing the pounding, grinding, and milling tasks are numerous on CA-SDI-813, as well as, at other sites in the park. The harvest and processing of Agave deserti (agave) apparently drew Late Prehistoric people to this location, parallel to the observations made in the ethnographic literature. The tools, bedrock milling/grinding/pounding features, abundant fire-affected rocks and associated roasting areas identified at CA-SDI-813, and its setting around dense agave “fields” certainly lead directly to that conclusion (Figure 5). Of course, other plants potentially important as food and additional uses, e.g., beavertail cactus, cholla, desert ironwood trees, Indian rice grass, Indian tea, etc., also are present in significant numbers on Mescal Bajada and environs. Site CA-SDI-813 yielded evidence of activities likely outside the realm of the mundane. The many cupule petroglyphs and the two yoni-style petroglyphs hint at rituals conducted here to aid in the maintenance of the society, and are not strictly subsistence related. The presence of beads might, too, be viewed as ceremonial or trade items, though, the Kumeyaay are reported to use beads, in particular, spire-lopped Olivella type, primarily as ornamentation (Schaefer 1999:39-40). The exotic items identified during the State Parks work in <?xml:namespace prefix = st1 ns = "urn:schemas-microsoft-com:office:smarttags" />Mine Canyon, e.g., shell from both the Pacific Ocean and Gulf of California, obsidian, pumice, and fish remains, indicate the prehistoric occupants involved themselves in exchange networks within the region, either directly or as a conduit. The many sites identified along Mine Wash, within Mine Canyon, and in adjoining drainages corroborate the conclusion that food harvesting and processing, esp., agave, were key aboriginal activities. The sites consist of large numbers of food-processing locations and isolated areas of roasting pits (Figure 6). Fifty-four sites located on or adjacent to Mine Wash (and near CA-SDI-813) included 22 sites with roasting pits only, 12 with bedrock milling and grinding features only, 13 showing bedrock milling and grinding features with other cultural remains, and three sites showing midden deposits and bedrock milling and grinding features. Archaeological sites in nearby drainages, e.g., Pinyon Canyon, manifest cultural remains parallel to those of Mine Wash. Core-based tools, e.g., manos, pounding implements, and others, are well represented in sites near CA-SDI-813, and obviously served as an important component in this food gathering and processing work. It may be then hypothesized that our subject site, CA-SDI-813, and adjoining sites played a role in prehistory consistent with the ethnographic pattern for the western <?xml:namespace prefix = st1 ns = "urn:schemas-microsoft-com:office:smarttags" />Colorado Desert. The Kwaaymii and other Kumeyaay people left their mountain homes to gather the desert in winter and spring and engage in other social-maintenance and, perhaps, spiritual, activities important to a viable human society. The chronological data from site CA-SDI-813 demonstrates this pattern of desert use extends back at least 1100 years ago, and, apparently, predates the introduction of ceramics into this area. Exotic raw materials and shell found within this site show the prehistoric inhabitants held connections to distant places to the east and west. The source of the exotic materials all lay in traditional Kumeyaay territory. The “draw” to Mine Canyon and surrounding areas likely included the dense plant distributions, well shaped and abundant bedrock, proximity to water, easy access to natural travel corridors leading to places throughout the region, proximity to other social groups, and other factors. 1998 A Paleoclimatic –Archaeological Model of Prehistoric Settlement in the <?xml:namespace prefix = st1 ns = "urn:schemas-microsoft-com:office:smarttags" />Mojave Desert. In Springs and Lakes in a Desert Landscape: Archaeological and Paleoenvironmental Investigations in the Silurian Valley and Adjacent Areas of Southeastern California, edited by Brian F. Byrd, pp. 79-136. Report on file, U.S. Army Corps of Engineers, Los Angeles. 1978 Cahuilla. In California, edited by Robert F. Heizer, pp. 575-587. Handbook of North American Indians, Volume 8, W. C. Sturtevant, general editor, Smithsonian Institution, Washington, D.C.
1978 Cupeño. In California, edited by Robert F. Heizer, pp. 588-591. Handbook of North American Indians, Volume 8, W. C. Sturtevant, general editor, Smithsonian Institution, Washington, D.C.
1991 The Cahuilla Landscape, The Santa Rosa and San Jacinto Mountains. Ballena Press Anthropological Papers No. 37. Menlo Park, California. 1972 Temalpakh: Cahuilla Indian Knowledge and Use of Plants. Malki Museum Press, Banning, California. 1973 An Archaeological Survey in the <?xml:namespace prefix = st1 ns = "urn:schemas-microsoft-com:office:smarttags" />Anza-Borrego Desert State Park: 1972 Preliminary Report. Pacific Coast Archaeological Society Quarterly 9(2):27-55. 1976 A Continuing Archaeological Survey in the Anza-Borrego Desert State Park: 1975-1976 Report. Pacific Coast Archaeological Society Quarterly 12(2):1-24. California Department of Parks and Recreation. 2003 Anza-Borrego Desert State Park: Preliminary General Plan. 1963 Ecological Aspects of Aboriginal Culture in the Western Yuman Area. Unpublished Ph.D. Dissertation, Department of Anthropology, University of California, Los Angeles. 1995 Reconstructing the Ethno-History of the Kwaaymii of the <?xml:namespace prefix = st1 ns = "urn:schemas-microsoft-com:office:smarttags" />Laguna Mountain San Diego County California. Report on file, California Department of Parks and Recreation, San Diego, California. 1978 Tipai and Ipai. In California, edited by Robert F. Heizer, pp. 592-609. Handbook of North American Indians, Volume 8, W. C. Sturtevant, general editor, Smithsonian Institution, Washington, D.C.
1992 Indian Hill Rockshelter and Aboriginal Cultural Adaptations in Anza-Borrego Desert State Park, Southeastern California. Unpublished Ph.D. Dissertation, Department of Anthropology, University of California, Riverside. 1986 Prehistoric Environments. In Great Basin, edited by Warren L. D’Azevedo, pp. 31-50. Handbook of North American Indians, Volume 11, W. C. Sturtevant, general editor, Smithsonian Institution, Washington, D.C.
1992 Geology of Anza-Borrego: Edge of Creation. Sunbelt Publications, Inc., San Diego. 1994 The Challenge of Archaeological Research in the Colorado Desert: Recent Approaches and Discoveries. Journal of California and Great Basin Anthropology 16(1):60-80. 1999 Pit and Mortuary Features at Protohistoric Lake Cahuilla Temporary Camp: Results of Supplementary Phase III Data Recovery at the Elmore Site (CA-IMP-6427). Report on File, Caltrans, District 11, San Diego, California. 1984 Volume I: Archaeological Investigations in the Western Colorado Desert: A Socioecological Approach. Report on file, California Department of Parks and Recreation, San Diego. 1962 Archaeological Explorations in the Southern Section of Anza-Borrego Desert State Park, California. Archaeological Report No. 5 California Department of Parks and Recreation, Sacramento, California. 1995 Piecing Together Anza-Borrego’s Archaeological Past. Unpublished manuscript on file, California Department of Parks and Recreation, Southern Service Center, San Diego, California. 1958 An Archaeological Reconnaissance in Bow Willow Canyon, Anza-Borrego Desert State Park. The Masterkey 32(5):155-166. 1960a The Surface Archaeology of Indian Hill, Anza-Borrego Desert State Park. 1960b The Indian Hill Rockshelter. Preliminary Excavations. 1962 Additional Excavations at the Indian Hill Rockshelter, Anza-Borrego Desert State Park, California. California State Department of Parks and Recreation Archaeological Report No. 5. Sacramento California. 1961 The San Dieguito Complex and its Place in California Prehistory. University of California, Los Angeles Archaeological Survey Annual Report, 1960-1961:246-338. Los Angeles. 2002 Great Basin Vegetation History and Aquatic Systems: The Last 150,000 Years. In Great Basin Aquatic Systems History, edited by R. Hershler, D.B. Madsen, and D.R. Currey, pp. 309-367. Smithsonian Contributions to Earth Sciences 33. Smithsonian Institution Press, Washington, D.C.
1985 Excavations at Indian Hill Rockshelter, Anza-Borrego Desert State Park, California 1984-1985. Report on file, California Department of Parks and Recreation, Cultural Resource Division, Sacramento.